Wedding scrapbook ideas are not difficult to come by, and it can be great fun 'scrapping' your wedding from that huge crop of photos you're holding. Of course, it's not easy to plan your wedding around your wedding scrapbook ideas, or you would miss the joy of the actual day! No, the key is to take (or have others take) a whole bunch of photos and then you can settle down comfortably and make your scrapbook with what you've got. In this layout, which does appear elsewhere on this site (it's not your imagination) I borrowed a photo from 42 years earlier. Was I cheating? You decide! 1. How You Met. Yes, that will include non-wedding day photos too, but that doesn't matter. Your wedding didn't come out of thin air, did it? 2. The Proposal. This could include the ring, of course, and also a photo of where it happened. (This can be taken after the event) Don't whip your camera out at the time - he'll think he's just proposed to a paparazzi! 5. The Bride and Groom, separately and together. 7. The Service, including the bride's entrance, the vows, the kiss, the baby that cried through it all, and the signing of the register. , never mind a themed scrapbook! 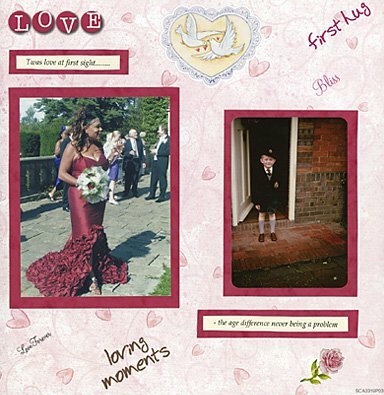 You'll never have more fun scrapping, than creating a wedding scrapbook.